Air France Concorde and Aeroflot Concordesky (TU-144) made in USSR, displayed at Sinsheim Auto & Technik Museum in Germany. (left)Lockheed Constellation under restoration work. Photo in Feb, 2006. (right) DC-2 Uiver, few existing airworthy DC-2. Photo in Sep, 2003. 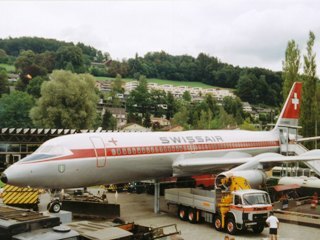 (left)The only preserved Convair 990. Photo in Jul, 2003. 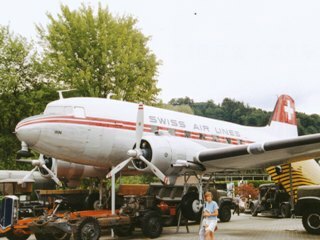 (right) DC-3 in Swiss Air livery. Photo in Jul, 2003.